Brigitte Macron, first lady Melania Trump, French President Emmanuel Macron and President Trump attend a state arrival ceremony at the White House on Tuesday. 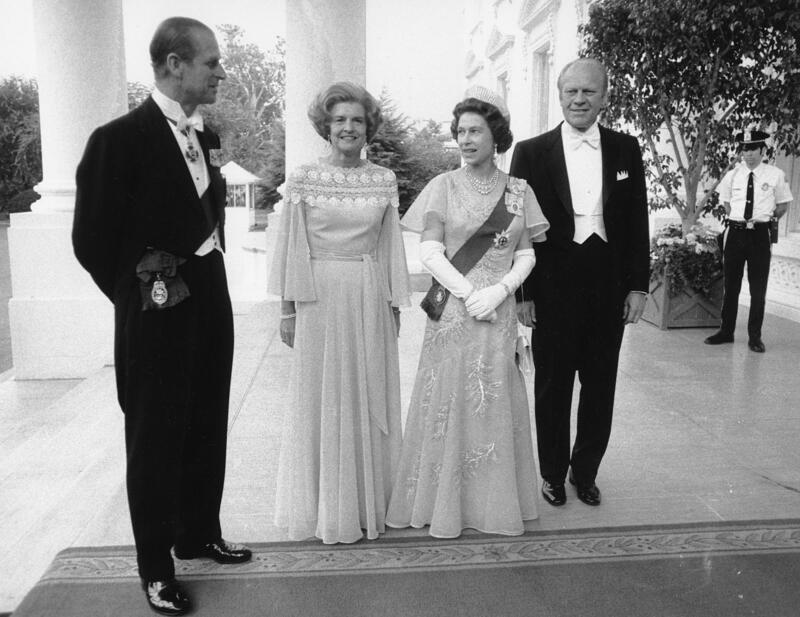 President Gerald Ford and first lady Betty Ford pose with Queen Elizabeth II and Prince Philip outside the North Portico of the White House on July 7, 1976. 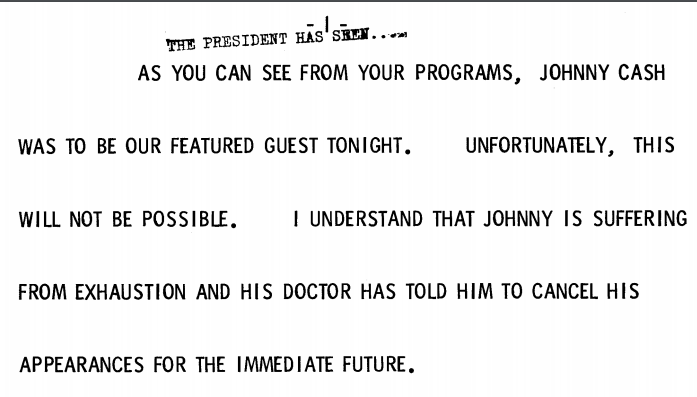 President Ford's remarks introducing Pearl Bailey and explaining why Johnny Cash was a no-show at the October 1975 state dinner. 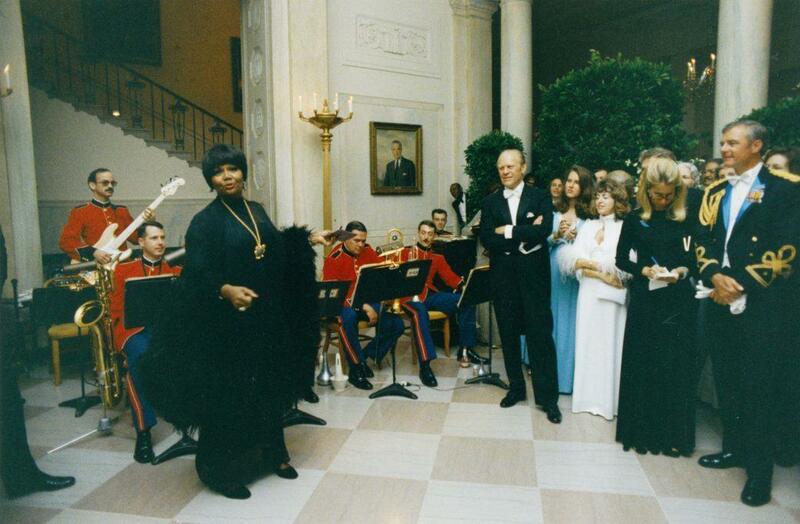 President Ford watches Pearl Bailey perform in the White House Entrance Hall during a state dinner in May 1975. 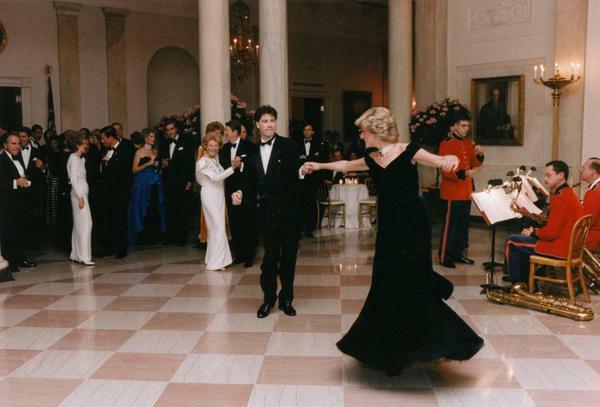 Actor John Travolta dances with Princess Diana during the Reagans' state dinner in November 1985. First lady Nancy Reagan reviews plans for the administration's first state dinner in February 1981. Dinner china is set for the first state visit of the Trump administration, in the State Dining Room of the White House on Monday. Fifteen months into the Trump presidency, the first state dinner, in honor of French President Emmanuel Macron, will be a big moment for first lady Melania Trump, who has kept a lower profile than many of her predecessors. 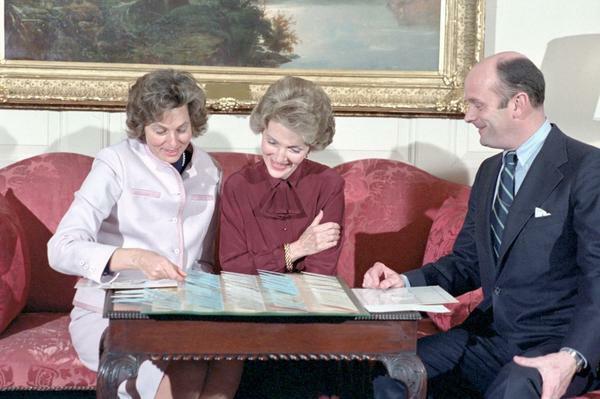 "It's much more than just a dinner," said Kate Andersen Brower, author of First Women: The Grace and Power of America's Modern First Ladies and a forthcoming book about vice presidents. When it comes to state dinners, every choice from the china to the shape of the tables and the number of guests makes a statement that reflects the tastes of the first family, and especially the first lady. And a whole lot of people are watching. C-SPAN even provides live special coverage of some dinners. "Laura Bush said she wasn't nervous before her own wedding but she was nervous before the first state dinner with the Mexican president," said Brower. "I think it's a lot of pressure." 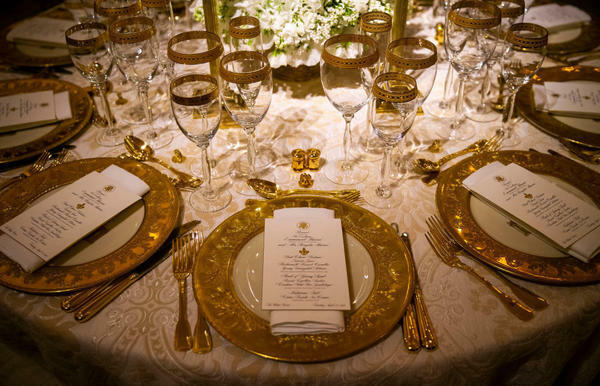 "A state dinner is far more intricate, an elaborate display of hundreds of moving parts, from guest lists and menus, which require an advance tasting, to table seatings, arrival protocols, and choices of linens, flowers, china, and silver, even the champagnes and wines." It went off without a hitch, the night ending with a fireworks display over the Washington Monument. The Obamas' first state dinner for the Indian prime minister in November 2009 wasn't quite so flawless. The menu was prepared by celebrity chef Marcus Samuelsson. Jennifer Hudson provided the entertainment. The decorations were lush. But it was all overshadowed by news of gate crashers Michaele and Tareq Salahi. They weren't invited but were auditioning for the Real Housewives of D.C. reality show and somehow made it past multiple layers of security to get into the dinner. "There are cautionary tales from every administration and no one escapes," said Lea Berman, who was White House social secretary in the time of George W. and Laura Bush and is co-author of a book called Treating People Well. "The first of anything and particularly the first of a state dinner after so long without having one, and this is not the first administration to wait an unusually long time to try a state dinner, makes it a little bit — the stakes are higher, let's say," Berman said of the Macron dinner. She argued the stakes should be high. Berman said this dinner in particular is important because of the growing friendship between Presidents Trump and Macron and the recent military strikes in Syria, which were conducted by both countries along with the U.K.
"You have the president and first lady extending not just their personal hospitality, but American hospitality, and it should reflect the best of what America has to offer," Berman said. Berman expressed confidence that the team in the first lady's office, which includes Bush administration veterans whom she stays in touch with, will be able to pull off the dinner. But there are some things you just can't plan for. There was the state dinner celebrating the Bicentennial of the United States and honoring the Queen of England. President Gerald Ford began to dance with Queen Elizabeth, just as the Marine Band struck up "The Lady Is a Tramp." "And afterward the social secretary Maria Downs said to the president, 'I was so embarrassed about that sir, do you think she noticed?' And he looked kind of grim and said, 'She noticed,' " Berman said. It seems the Ford administration may have been star-crossed when it came to state dinners. In October 1975, Johnny Cash was supposed to provide the entertainment for a dinner honoring Egypt's Anwar Sadat. "You can see from your programs, Johnny Cash was to be our featured guest tonight," President Ford's remarks read. "Unfortunately, this will not be possible." Instead he introduced Pearl Bailey, a Broadway performer who had provided the entertainment at another state dinner earlier that year and also during the Nixon administration. Behind the scenes there had been a mad scramble. "At the last minute, literally they day of the event, they had to find a new entertainer," said Berman. Every modern administration has approached state dinners differently, reflecting the tastes and styles of the first lady at the time. The Eisenhowers used tables connected end-to-end in the shape of a U. But that didn't work for the Kennedys. "Jackie Kennedy came in and said, 'Look, I want smaller cocktail tables so people can actually talk,'" said Brower. The Reagans, Clintons and Obamas had more celebrities in attendance than other administrations — though Nancy Reagan preferred small, intimate gatherings, while the Obamas went big often with the dinners held in tents on the South Lawn. Tuesday night's dinner, said Brower, will be the first chance to see how the Trumps entertain in the people's house. 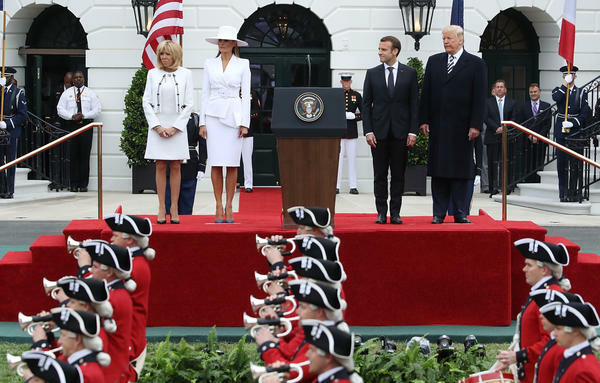 In a statement, the White House said the first lady carefully selected all details of the dinner to "complement and pay homage to the long-standing friendship between the United States and France." The menu is meant to pay tribute to American culinary traditions with "nuances of French influences." It begins with a course of goat cheese gateau, tomato jam, buttermilk biscuits and greens from the White House kitchen garden. The main course includes lamb, cipollini soubise and Carolina gold rice jambalaya. To finish it off, the Macrons will be treated to a nectarine tart with crème fraîche ice cream. The meal will be served on both the Clinton and George W. Bush china, which features a green color palette to complement the green flowers that will be featured in the dining room. There will also be more than 1,200 branches of cherry blossom, all homegrown in the United States, and more than 2,500 stems of white sweet peas and 1,000 stems of white lilac. The Kennedy Center's Washington National Opera is expected to perform. Still, some questions remain: Who made the final guest list? What will Melania Trump wear? "Melania I mean, God, everyone's going to be watching to see her expression and what she's wearing," said Brower. "We just know nothing about her. She's such a cipher." One possible hint: In 1999 Melania Knauss, then just dating Donald Trump, told the The New York Times that if she and Trump were to wind up in the White House, she would be very traditional — "like Betty Ford or Jackie Kennedy."